In 1998 Captain Sensible (Ray Burns to his mum) released an album – something like his sixth — that again showcased his versatility. Though Sensible came to (primarily UK) fame as bassist in one of Britain’s seminal punk acts The Damned, in his solo work The Captain displayed his love for other forms of music as well. 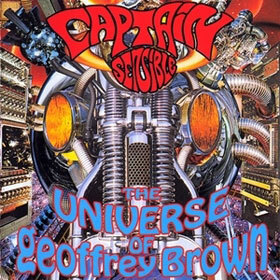 While all of his (relatively hard-to-find) records are worthwhile, he was at his very best with that ’98 record titled The Universe of Geoffrey Brown. 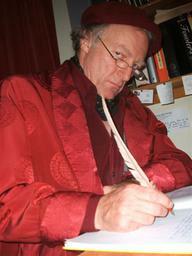 A close collaborator on that project was Martin Newell. During my recent conversation with Martin, our talk eventually turned to the Captain’s concept album. BK: Yes, I know! My question: the bits in between — the dialogue – is that you speaking? Martin: I wrote it, but it’s not me speaking. They got professional actors in for that. Those were BBC Radio actors. BK: To me, that’s the Great Lost Concept Album. I love it. Someday it might get made; it’s a really good story. It’s the Captain’s concept; I was just his amanuensis. I helped him to realize it. One of the first things I thought when I began working with him was, “‘Wow, a concept album? He’s one of the founding fathers of punk and he wants to do a concept album!” But I was up for it. So we did it. It took five years to make it, though. It would make a really good Broadway musical. Or West End musical. BK: The whole thing hangs together, but if you pluck any one of the songs out, it stands on its own. And that’s the problem with some concept album music; some pieces only work in context. Martin: Originally, it was only one song. The [title track] last song on the album. Then when we expanded it, that song got bunged on as an afterthought. [Martin sings a few bars of the tune.] I had to condense the whole idea into one song. And then Captain being Captain, said, “Do you think we can make a whole album?” And I said, “We’ve already said it all in one song!” So then we had to pad it out. And then Captain said, “We need some dialogue.” And I said, “But I don’t write dialogue!” We’re talking about twenty-five years ago now. I was finding my feet as a writer; I had written articles, reviews and even poems…but not dialogue. I had never tried my hand at proper radio dialogue, but once they put some proper actors on it, it all worked. Have you ever heard of an English deejay called Anne Nightingale? She’s in the same genre as John Peel. She’s still a great deejay; she’s got to be about sixty-something now. Her husband was called Binky Baker. He was a BBC actor, and a very good one. A classic English gentleman. I only ever met him once, and I think he threatened to fight me. I said, “What’s your name?” And someone said, “Oh, don’t start any trouble, Binky.” This was in a nightclub. And I said, “Binky? Oh, you’re called Binky?” And he said, “Oh, do you want to make something of it?” I asked, “You’re not Binky Baker, are you?” He said yes, so I told him, “I wrote some script for you! You did the Captain Sensible thing.” He said, “What of it?” I told him it was brilliant. And he just melted, like any old stage queen.